How to celebrate a perfect weekend in the heart of London? We have been asking this question to ourselves, to bloggers and lifestyle experts over and over. Every time the answer is the same – add some food to the day. Although the name says so, there are no bad eggs at the Bad Egg. This is the dude food with attitude kind of place with a scruffy look. This making hanging out in your jammies seem completely normal at 11 am! The “Frunch” is quite the event here. Punk soundtracks and neon lights complement this Friday night lunch is perfect. The North American influence in the menu is quite apparent with their mini tacos and pancakes with fried chicken toppings. 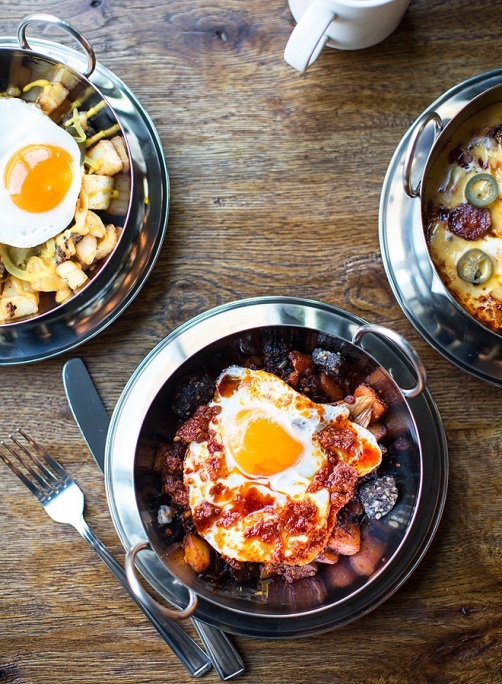 This place is a rave for its unlimited Bloody Marys, Prosecco and mimosas at £35pp. Beany Green offers a brunch of a lifetime for those interested in exploring the nature inspired treats of London. This Aussie café has an all-day menu that includes broccoli and corn fritters with banana bread sarnies filled with mascarpone, almonds and berries. It is a new delight for the eyes and the tastebuds. If you have a sweet tooth, the banana bread sandwich is a must from Beany Green. Pocket pink is around £30 for two. Browse through the Gourmet Guide Restaurant Gift Vouchers to see if you can find any exciting offers on this eatery. This black building is rather imposing from the outside. From the inside, Bourne & Hollingsworth is every bit of an open colonial British restaurant as possible. It transports the diners from the heart of the city to a colonial era Delhi with its elegant décor and period furnishing. It is the ideal place for laid-back brunches, a few bottomless cocktails and interesting gossip. This is a place where you can catch up with an old friend and propose to your love over a warm New York-inspired brunching platter. Do not forget the sinfully delicious huevosbenedictos with spicy chorizo and béarnaise sauce. The Chiltern Firehouse is a London restaurant that has a long waitlist. You have to be an A-list celebrity to get your reservations.TheChiltern Firehouse does brunch between 11 am an 3 pm during the weekends. It is marginally easier to get tables. The prices are akin to some of the best 3 Michelin Star establishments in the UK. The food is delectable, and the presentation is a work of art. The restaurant accepts no reservations, so get there as early as you can. There is no better way to celebrate your lazy weekend than eating out with your special someone and your friends. Forget early breakfasts, awkwardly early lunches. These restaurants add some style to the bunching scene in London. Author Bio: Franck Lloyd is a self-taught chef and food reviewer. He loves to explore new places and try new things. That is why to win Gourmet Guide Restaurant Gift Vouchers follow this blog.